Image Credit: Sloane Digital Sky Survey (left), NASA/Swift/UVOT (right) Burst star bracketed. Back in February, NASA's Swift Gamma ray telescope caught a curious burst of energy. Today, no less than four papers appeared in the journal Nature explaining the meaning of that energy burst. It looks as if we have caught a supernova explosion in real time. Gamma ray bursts have long been frustrating. Trying to associate these transient bursts with astronomical objects or events has been difficult, because of the short nature of the bursts. This time, the Swift telescope cauge this unusually long burst in time for a batter of telescopes to observe the area, and for the first time were able to follow a supernova from the very early stages in a great range of wavelengths. The best studied supernova to date , SN 1987A, lacks obervations in the early stages of the event. It appears that the gamma ray burst was unleashed from the core of a massive Wolf–Rayet star as it began to collapse on its way to Supernovahood. Intrestingly though, this star was less massive than those typically thought to be capable of producing gamma ray bursts. Unfortunately, to read the articles and commentary you need a subscription to Nature, but you can listen to the podcast, which discusses the gamma ray bursts (as well as other things), for free. Last year I read an absouletly enchanting book ... about the history of telescopes. You might think that this would be dry-as-dust boring, but Stargazer, the life and times of the telescope, was a riveting, and in many places rollicking, read. 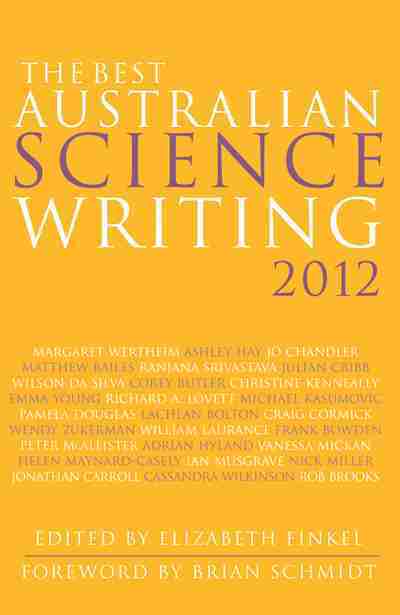 Fred Watson, the author of this book, is an outstanding Australian astronomer, he is the Astronomer-in-Charge of the Anglo-Australian Observatory (AAO) at Coonabarabran, and also runs a program to to map the orbits of a million Southern Hemisphere stars. All this, and he can write crakerjack books as well. So I was greatly (if belatedly) chuffed to learn he has won a Eureka prize. Fred's prize was for science communication. As well as being a very active astronomer, he alos tirelessly talks about astronomy to all and sundry through radio shows and talks to the community. The ABC sicence show reported on the Eurekka prizes last weekend, with Fred Watson as one of the guests. You can listen to the show or read the transcript here. The September edition of Southern Skywatch is up now. 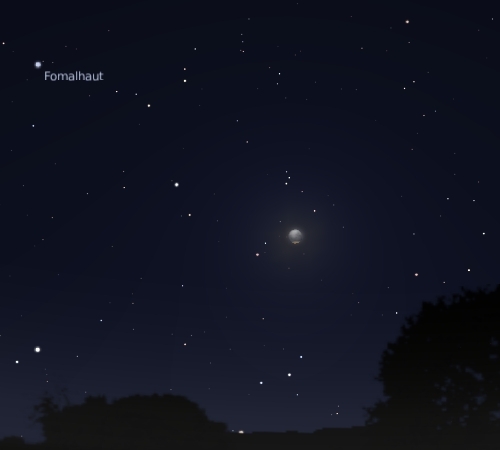 This month we have an occultation of Uranus, a partial lunar eclipse, and sundry other planet shenannigans. Don't forget tonight and tomorrow night there might be some Pavonid meteors from comet Levy. Now you can watch SMART-1 smash into the Moon. 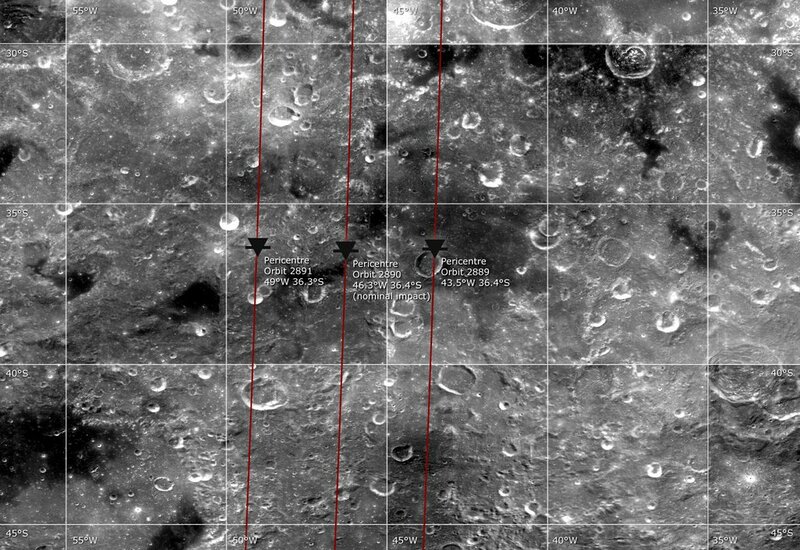 The SMART-1 spacecraft has been quietly mapping the Moon in exquisit detail while at lot of attention has been focused on Mars. The mission got extended, but now SMART-1 is out of fuel and is spiraling down for an impact on the Moon. And we might get to see it (the impact that is, well, those of us with telescopes). On September 3 0541 UT (that's 15:41 AEST, so us Aussies won't get to see it, see here for impact visibility) SMART-1 will impact the Lake Of Excellence. The impact will be on the dark side of the Moon, and there should be a brief flash of light (like the Lunar Meteor impacts seen in previous years). 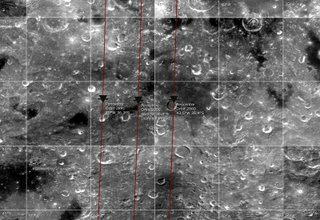 Instructions for training your telescope on the Moon can be found at this ESA site, or at this Lunar Impact Monitoring Site. Video briefings about the impact can be found here. A New Meteor Shower in Pavo? The Southern Sky, facing due south at 11 pm with the proposed radiant circled (click to enlarge). John Drummond has reported that there may be a new meteor shower in Pavo, from Comet Levy (P/1991 L3), possibly visible over the next few days. 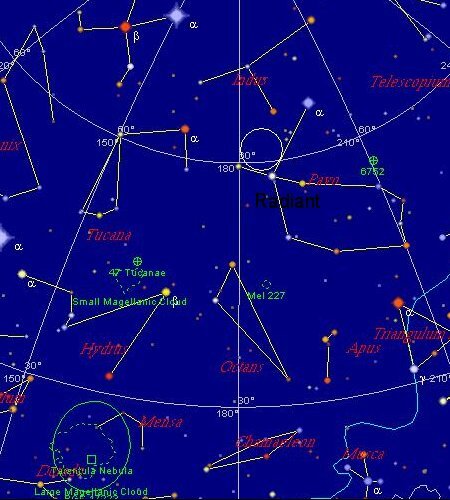 The peak of the shower will be on August 31 and September 1, and the radiant is situated roughly between alpha and beta Pavonis (see the map on the right). 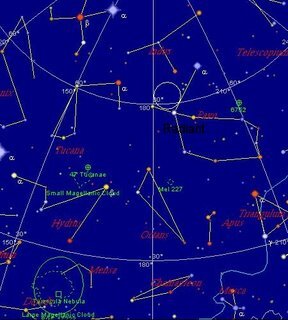 A full sky map with the radiant shown is here. How many meteors can you expect to see? Possibly none, maybe one or two per hour, maybe more. It's best to view after 11 pm, when the Moon will interfere less and the radiant is still high. The Moon glides past Spica in the early evening. Well, my astrophotography jinx stayed away for one night. The sky, which was cloudy for most of the day, cleared up in time for me to take some shots of the Moon near Spica. Unfortunately, the event occurred just on top of our family dinner, so I had to rush around a bit putting out the dinner things and taking the odd shot. I couldn't do any telescope imaging until dinner was over. So Spica was past its closest approach and wouldn't fit into the frame in one shot, some assembly was required. Anyway, it think they came out reasonably well under the circumstances. 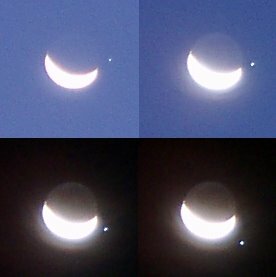 I also got some shots of a shadow transit of Jupiter. I'll process them later. Spica above the Moon, mosaic of 3 images (not guaranteed to be perfectly aligned. Click to enlarge the image. The northwestern horizon at 6:15 pm in Adelaide (click to enlarge). Similar views will be seen at similar local times in Australia and New Zeland. I've been a bit preoccupied with Pluto, so I nearly forgot the occultation of Spica. Tonight, people in Tasmania and Southern New Zealand will see the crescent Moon glide in front of the bright Star Spica. Tasmanians will see it disappear at 18:59 AEST, New Zealanders around 21:03 see Southern Skywatch for more details. The rest of us will see Spica spectacularly close to the crescent Moon, in Adelaide the Moon will be a mere 6 minutes of arc away (it will look like it is almost touching) at 18:15 ACST. In Melbourne it will be 4 minutes of arc at 18:57 AEST. So go and have a look between 6:00 pm and 7:00 pm and watch Spica glide past the horns of the Moon. The Pain of Pluto's Passed On Planethood. The IAU decision to demote Pluto to "Dwarf Planet" has been resounding though the blogosphere and the ordinary news media. As the ABC has reported, kids are upset that Pluto is no-longer a planet. A typical kid-parent exchange goes like this. Meanwhile planetariums are scrabbling to update their presentations. The family of Clyde Tombaugh, the discoverer of Pluto, has been variously reported as being "saddened" by the change, and saying that "he would understand". For people that are confused about the change, Stuart has a good explanation of what happened and why. Cosmos magazine has an online editorial about why Pluto had to go. The Planetary Society has some good Pluto resources on their front page, and a great list of the top 10 reasons why Pluto is/isn't a planet. 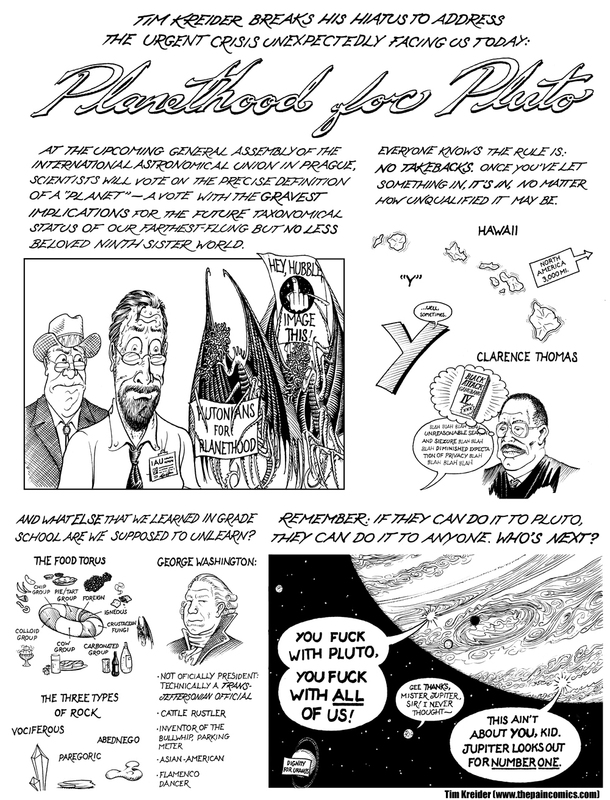 Over at The Pain-When will it end, is a great cartoon on Pluto's demotion. Meanwhile, over at Cosmic Variance, Sean reminds us that some rather momentous things have happened in astronomy this week, so we should put Pluto's demotion into perspective. View of the north-eastern horizon at 6:10 am 27 August, ACST as seen from Adelaide (click to enlarge). Similar views will be seen elswhere in the Southern Hemisphere. This Sunday morning, Saturn and Venus will be so close as to almost seem to be touching. Unforntunately they are very close to the horizon, so you will need a flat horizon free of obstructions to see them clearly. Nonetheless this is a pretty rare close approach for the two, so do make an effort to see it. Pluto is dead, so lets have a competition! The reaction to the IAU decision to demote pluto is causing shockwaves around the world. Astonomers are stunned, and school children are sending the IAU hate mail. My mate John Wilkins points out that the problem will just go away by itself. But in the meantime, lets have a competition. We need a planet name menomic to replace "My Very Easy memory Jingle Seems Useful Naming Planets". I've proposed "My Very Easy Memory Jingle Seems UB313-less Now" [evil grin]. The International Astronomical Union has finished its deliberation, and Pluto has been demoted to "Dwarf Planet". So Now there are 8 Planets, an as yet to be determined number of Dwarf planets (Pluto, UB313, possibly Ceres and 2005 FY9), and an as yet unnamed group of small icy things. The blogosphere is all aflury with the news. Stuart has a good report hot from the IAU. Both the Bad Astronomer and Tom ruminate on the meaning of all this. On Jodcast (nimbly edited by Stuart) you can listen to an edited version of the deliberations (and there are also heaps of good IAU links). The video of the full deliberations is here. Blast, I was looking forward to 12 planets. My Very Easy Memory Jingle Seems Useful Naming .... seems a bit silly now. Maybe it should be My Very Easy Memory Jingle Seems UB-less Now. 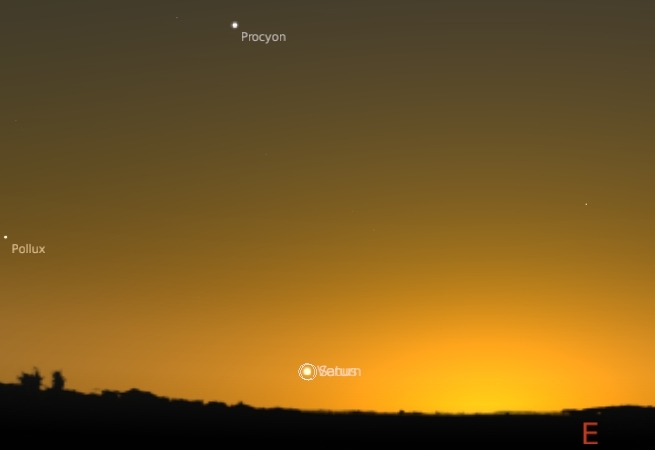 The western evening sky at 6:20 pm ACST Frdiay 25 August, similar views will be seen elswhere at the same local time in the Southern Hemisphere (click to enlarge). 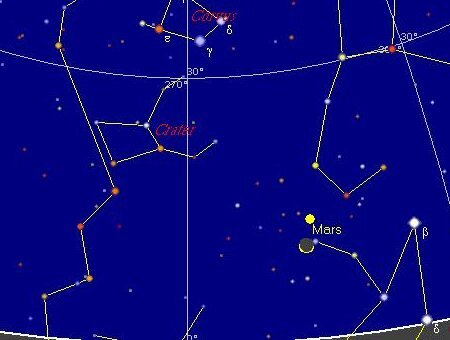 Mars has been difficult to pick up for some time, but this Friday the thin Crescent moon will be just below Mars. While not spectacular, it will be a rather attractive sight in the early evening. Today (Thursday) the IAU will be voting on one of 4 proposals to define what a planet is (at 11:30 pm local time). As Stuart reports, there has been a lot of ahh.. vigorous debate about what constitues a planet. The two key proposals are 5a, which will demote Pluto, and leave us with 8 planets, and 5b, which keeps Pluto as a planet, but promotes Ceres, UB313 and Charon to planets. You can watch the live video here (starting at 11:30 pm CST). As a biologist, I find this somewhat amusing, planetary formation is a continium, at one end we have dust, at the other bodies that just miss out on sustainable fusion. Naturally any attempt to place a lower boundary on what a planet is will be a bit arbitary. Personally, I can't see any reason why we shouldn't have 12 planets (it makes the menomics harder is all). If Mercury, a rock ball a bit bigger than our Moon, is a planet, why not Pluto, and if Pluto, why not UB313. Frankly, I expect it will end in an impasse, as I can't see enough people wanting to demote Pluto, and enough people wanting to promote Ceres. 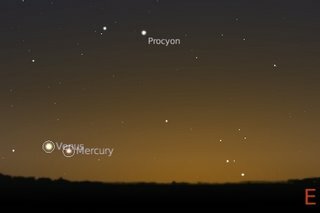 Mercury has now disappeared from our skies and is heading for Superior Conjunction in September, then it will reappear in the evening sky in late September. In the meantime, here is Mercury caught in the LASCO C3 camera (the bright object on the far right of the image). Sunspot action is also happening again. Sunspot group 905 has roated onto the face of the Sun, it will be interesting to watch it develop over the next few days. I would have thought the debate over wether dark matter exists to be long over, afte all, simple mass calculation and gravitational lensing shows that galaxies contain more mass than can be accounted for by shiny stuff like stars. The controversy is over what the dark stuff is. Some of it is non-glowing gas and planets (and possibly neutrinos), but most people think the majority is some unusual form of matter. 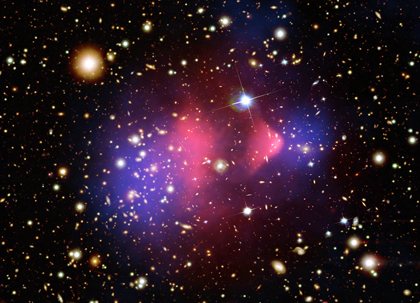 Some stunning work from the Chandra X-ray telescope has thrown new light on Dark matter by mapping its distribution in colliding galaxies. The Chandra press release is here, and an ABC science article is here. For the best description of what it all means though, run, don't walk to Sean Carrolls' article at Cosmic Variance. The foolow that up with Mark Chu-Carrols' article at Good Math Bad Math. Everyones seen this picture of the Earth from Space. 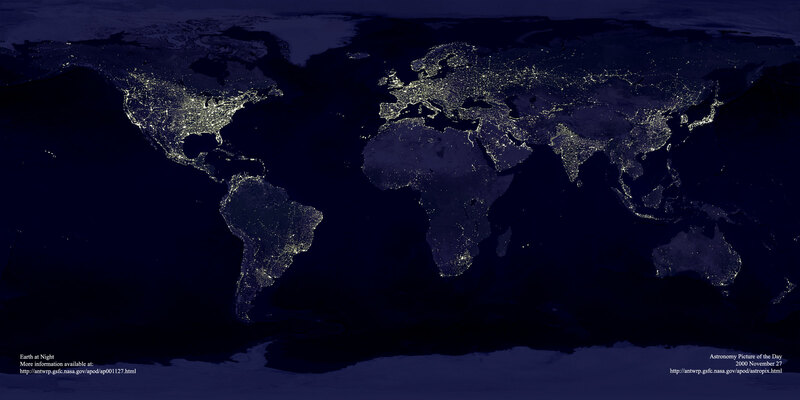 Well here is a site devoted to mapping light pollution from space. As well as images of various parts of the Earth glowing gently, there are maps of limiting star magnitudes, and the rate of increase of light pollution. Scary Stuff, I get frustsrtaed by the skies at my suburban home in Adelaide, but we are dark compared to most of Europe. Time to join the Dark Skies Assotiation. 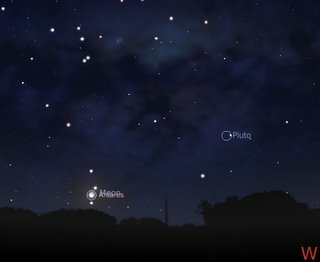 Here is some Dark Sky resources from Adelaide to get you going. Dropping our international visitor at the interstate train terminal, we were greeted with banner headlines proclaiming NASA was going to launch supplies to the International Space Station from Woomera. The NASA decision was also featured on the ABC radio news as I drove back. As I written before, I have always been fascinated by the Woomera Space facility. It fueled my dreams of Space when I was a kid, so see this news excited me, maybe my kids could have a carree in Space Science. The reality is not quite so rosy, the story is that NASA has contracted two private comanies to develop launch vehicles. At the end of the two years or so, NASA may not choose either of the two companies competeing to launch material at all. One of them, Kistler, as been "setting up" launch facilities since 1998, so I am less rosy about the chances of successful launching in a two year time span. Ah well, one can but dream. Well, Open Day is over for another year. I spent the whole day at our Schools stand, talking about how wonderful science is. As this is something I passionately believe in, it's easy for me to spend a lot of time talking. The Bettdeckererschnappender Weisle and the boys went to the Science Week exhibits at the South Australian Museum, while I entertained prospective students with Balloon Molecules. There is a serious purpose in this, while people were mildly bemused to recieve models of agmatine, and look at the demonstration model of noradrenaline I made, I use 3D molecular visualization in my classes to help students get a feel for how chemical structures interact. I use either plastic models or computer based programs, but ballon molecules are inexpensive, simple to make and don't require a working computer in a class room. They are a good fun way to get students thinking about molecular shapes. Science Week offically finishes this Sunday, although some events stretch into next week. Between my sons' (appalingly early) soccer match and Science Week events, I'm going to be very busy, so expect a bit of silence for a while. However, if you are in Adelaide and visiting Uni Open Day on Sunday, do drop in to the Health Sciences Stand. There may be an amateur astronomer prentending to be a pharmacologist there. It's old news that the Angry Astronomer has writen an excellent post on Big Bang Myths. It's already been lauded by the Bad Astronomer and others. However, it does provide an excuse to segue into these videos on people creating enormous explosions with sodium, and this very nice chemistry video that features big explosions with sodium, caesium and rubidium. This is slightly old news, but still worth commenting on. Intelligent Design creationists have apparently been beavering away in the background here in Australia. The new Federal Education and Science Minister Julie Bishop has just said it (ID) should not be taught in schools. "I have had submissions in relation to this matter and as the minister for science I can state that it's my view that it is not part of a science curriculum," Ms Bishop said. I thought this was all done and dusted when the previous minister Dr. Brendan Nelson, after appearing to support ID, said that it shouldn't be taught in schools. Perhaps the ID creationists thought the regime change was a chance to have another go. My mate John Wilkinns has his own perspective here. A news item in the International Astronomical Union site reveals a proposed definition of planets that will keep Pluto as a planet. This keeps Pluto as a planet, and UB313 becomes a planet... as does the asteroid Ceres, surprisingly. This definition is different from the one Stuart has discussed. Has the New Solar Cycle Started? Sunspot group 904 is pretty big now, and being almost face on easily visible using safe solar projection techniques, or with the unaided eye. Top of the Lawn shares his sunspot experience with us. All is relatively quite in the solar storm are though, so no aurora are expected from this group. 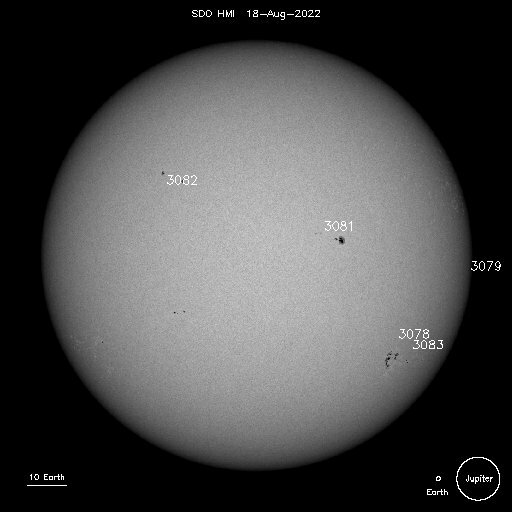 However, back on July 31, there was a small, inconspicuous sunspot. This sunspot was unusual in that it had the reverse magnitic polarity to what you would have expected. We are currently at solar minimum, and a new sunspot will begin when the sunspots reverse polarity. The new sunspot cycle, cycle 24, is ecxpected to be particularly strong. 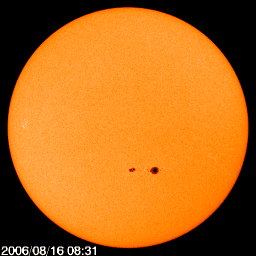 However, the reverse poarity sunspot didn't last very long, so we may not be in a new cycle yet. See Science@NASA for the full story. Somewhere in July the number of extrasolar planets passed 200. Despite the number of them, I still get excited over them, a new "low" mass planet (7.5 times Earth mass the lowest mass ever found so far), has just been described in a three planet system! 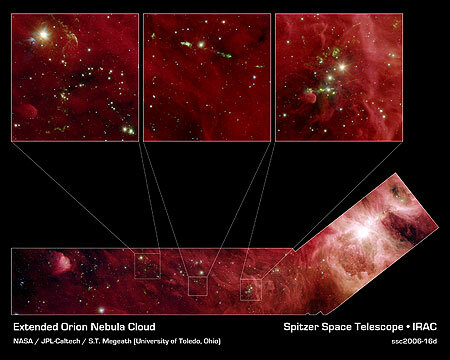 But new results from the Spitzer Space telescope potentially blows that total away. The image to the left of Orion and the region near it looks a bit like a hockey stick. The are that looks like the shaft stretches 70 light-years beyond the Orion nebula. This area contains 800 stars about the same mass as our sun. These sun-like stars don't hang out in big clusters of stars like the one in the Orion nebula; instead, they are be found in small clusters (right box inset), or in by themselves (middle box inset). Stunningly, the infrared Spitzer Space telescope found 2,300 planet-forming dust disks around young stars in the Orion cloud complex. While these dust disk may not have formed planets yet (although there may be protoplanets in them), the very thought that there are potentially 2,300 planetary systems just a stones throw away (cosmically speaking) is truly mind-boggling. Head over the Sutart's Astronomy Blog right now and help him celebrate his 500th post. As well, pop into his post on the International Astronomical Union meeting and follow the links to live blogging, pod casts and all sorts of resources. Wait with baited breath while the latest proposal to determine if Pluto is a planet is debated. While I'm on a roll, here is a link to an MPEG movie of a Lunar Graze by the star ZC 2505 from Dave Gault. It's the odd megabyte or two, But you see the star skimming just above the southern lunar pole. First it disappears behind a mountain, then it reappears in a valley and finally disapears again. Quite nice. Don't forget this is Science Week! You can search for events here. There's a few astronomy events on, as well as a whole pile of toothsome sicence. If you are in Adelaide, check out Science Outside the Square. Comets P/2006 HR30 (Siding Spring) and P1 (Mc-Naught) and around magnitude 15 or so at the moment, and only really visible to popel with serious kit. However, there are some nice images of HR30 (found by Australia's Siding SPring Observatory) here and here and a nice animation here. 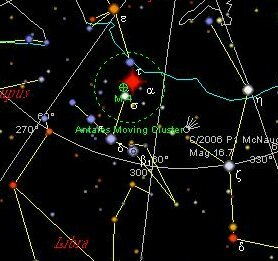 P1 Mc-Naught (discovered by an Australian astronomer, Rob McNaught) is currently in Scorpio, but during January 2007 it will swing past the Sun, possibly becoming brighter than magnitude 2. 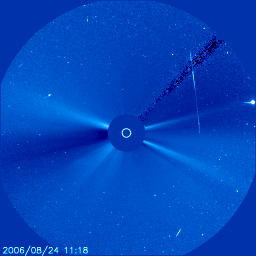 While this wil be unobservable to us (too close to the Sun), it will possibly be caught on the SOHO C3 camera. P1 will also probably be a reasonably bright but difficult binocular object in the Southern Hemisphere in late January early February. Images of P1 McNaught are here. This recent report records the recovery of a substantial meteorite (700 g) from inside the roof of a warehouse, where the meteorite had punched a hole. This is probably the clearest authentic pice of meteorite from a July 14 fireball over Norway. This fireball is unrelated to a June 9 fireball also from Norway. The reports were a bit overhyped, and very dubious claims of meteorite impacts were made. Sunspot group 904 is growing, and is now big enough to see with safe solar projection techniques. It is even visible to the unaided eye (as a dot) when safely behind eclipse-grade solar film (never look at the sun directly). WHile tempted to drag out the reflecter and web-cam, I was seduced by gardening and playing basketball with the kids instead. Although of substantial size, we are unlikley to get much geomagnetic action from this group. Here is a stunning image of this group. Sunspot group 904 has just rotated onto the face of the Sun. I'll keep an eye on these, as they have the potential to become big and interesting. It's not how I would teach Astronomy. The morning sky facing East about 6:10 am from Adelaide. Similar view will be seen in most of the Southern Hemisphere at the same local time. 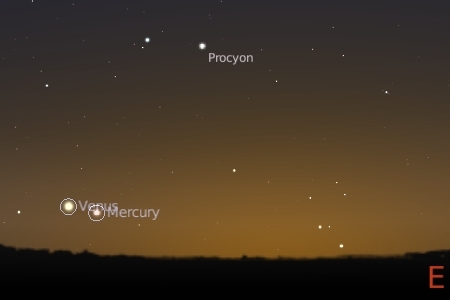 Over the next few morning Venus and Mercury will be a mere 2 degrees (about 2 fingerwidths) appart in the morning sky. The best time to see these beauties is between 6:10 and 6:35, when the sky is reasonably dark (o5 5:30 and 6:00 if you live in Brisbane), but unfortunately the pair are close to the horizon. 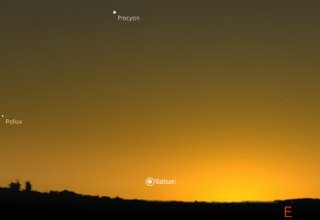 Venus can bee seen quite a bit later, but Mercury will fade from view rapidly after 6:30. Unfortunately, we Australians didn't see any aurora last night, but over at the Space Weather Gallery is a whole bunch of pictures from Canada an the US where they had a very nice show. Solar wind speed from the IPS space weather site. This image should update every 15 nimutes or so. 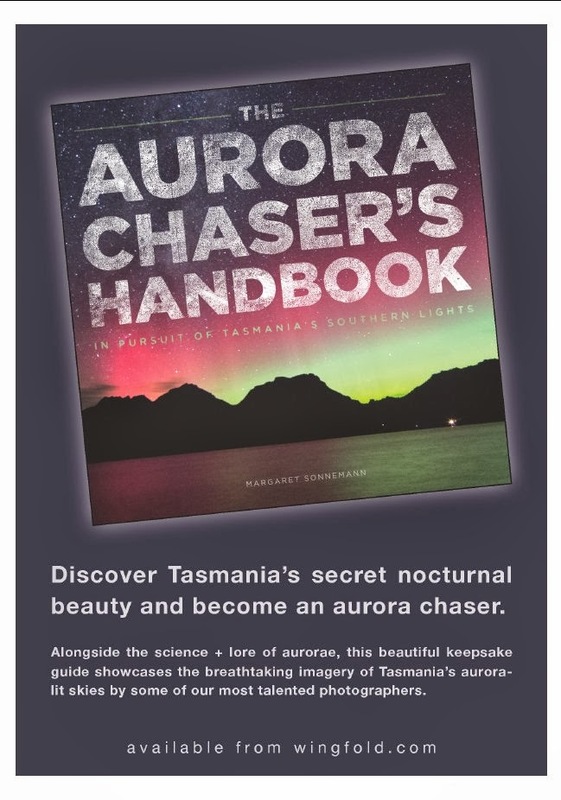 There is a good possibility that people in Southern New Zealand and Tasmania might see auroral activity tonight (tasmanians should look now), although light from the waxing Moon will interfere, and dark sky sites have the best chances of seeing anything. People in Southern Victoria might have a possibility of seeing some display. The Mars Hoax is back. Despite the fact that Mars is not currently at opposition, yet another round of emails claiming Mars will appear as big as the Full Moon this August are going around. Needless to say this is not true, at the moment Mars is a tiny dot in all but the biggest telescopes. More details at the Spaceweather site and Tom's site. Comet 177P Barnard, curently low in Hercules so a bit difficult to catch in Australia, isn't causing the same excitement as 73P, but it's a nice magnitude 8-9 comet. Links to images of this comet are here and here. Clouds are being very annoying at the moment, but reader Louie Blyton has alerted me to this article on nacreous clouds, beautiful "mother of peal" coloured clouds which form in the extreme conditions above Antarctica (-80 deg C). Our own ABC Science-on-line also has an article on these clouds. The frequency of their formation may be an index of global warming. 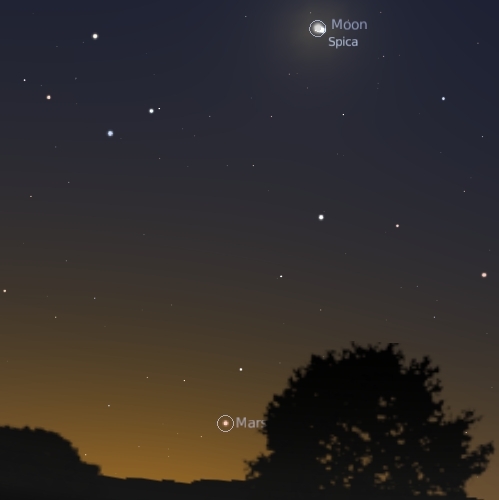 The red heart of Scoripius, Antares, will be covered by the Moon in the early evening of August 4 in South Africa, and the early morning of 5 August in Western Australia. The occultation track with UT timings is here. In Cape Town, Antares will disappear behind the dark side of the Moon at 6:22 pm (4th) local time, and reappear from the bright side at 7:29 pm. 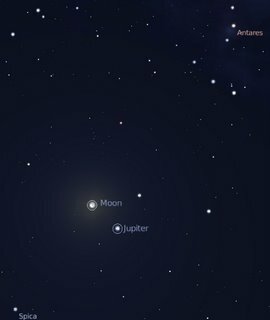 In Perth, Antares will disappear behind the dark side of the Moon at 2:33 am (5th) local time, and the Moon sets before Antares reappears. Science Week is coming up, and there are lots of activities for interested people of all ages. Check out the Science Week Diaries for activities in your area. And do take the Australian National Memory test. Of course, there is too much to fit into two weeks, so there are many "pre-events". If you are in Adelaide, there is an open observatory night at The Heights High School, Modbury Heights, this Friday at 8:00 pm. Costs $4 for adults, $1 for kids. Full details via the link above. Of course I won't be going, Eldest one and I got given free tickets to the Soccer on that night, so we are already committed. Like tonight, it was a playoff between a free talk on Global Warming by Adelaides Thinker in residence Stephen Schneider and Comedienne Rachel Berger, and a talk by Noble Laureate J. Robin Warren speak on his work on bacteria and ulcers. In the end we stayed home and held a birthday party for Middle One's toy dog. I drew a spaceship card for him. 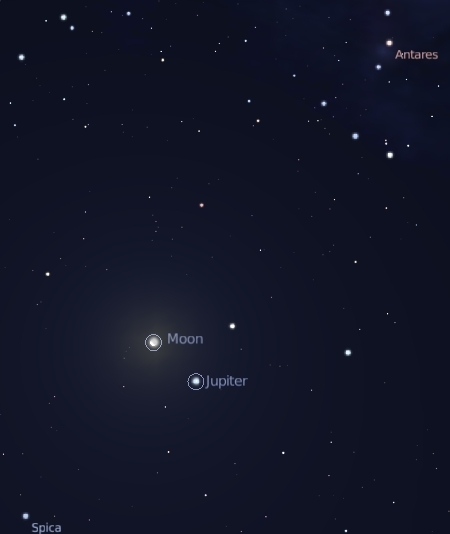 Wednesday August 2 (that's tomorow night as of now), the waxing Moon will be three fingerwidths to the left of Jupiter. If you are unsure of which object in the evning sky is Jupiter, tomorrow night is a good night to find out. Look to the right of the Moon, by three fingerwidths, and there it is. It will be easy to remember after that, as Jupiter is currently the brightest object in the north-western sky (for us Southern Hemispherians that is). It will also be a good night to check the Movement of the Moon. Every night the Moon covers about two handspans distance across the sky, that's roughly a fingerwith every two hours, something that is easily observable.. if you have a landmark to tell the position of the Moon. Well, you can use Jupiter as your landamark, check the position of the Moon against Jupiter every hour, and you can watch the Moon move across the sky. 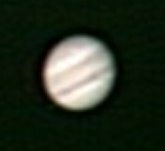 If you want to see more great pictures of the Great Red SPot and Red Spt Jr, head over to the Bad Astronomer. The August Edition of Southern Skywatch is now up. Occulations of Antares and Spica, and some close encounters between Venus, Mercury and Saturn.